It's Not About Me | Daddy's in Charge? I can't believe it's almost 2012 already. It seems all I ever do on this blog is thank you all for stopping by. I truly am grateful that any of you would take time out of your busy lives to see what I am doing with my life. Most of my time is obviously spent playing with Legos and the fact that so many of you actually care about that sort of thing is mind boggling. Outside of a few Disney Cruise Ship reviews my silly little Lego movies are by far my most viewed posts. Three of them have settled nicely into my Top 10 posts of all time. I pondered taking my boys camping, I made a post for my friend Scott and Samuel L. Jackson got a snake out of my yard. I realized in the past year that I have a lot of Legos and the possibilities are endless. It all started with a simple Day in the Life post. I don't know what actually inspired me to do it, but thank God that I did. I have taken great pride in sharing my Lego family with you and am touched that you have taken the time to watch. This blog is much more than Legos though, it's about two kids. Tyler and Carter are the two most awesome kids, and I get to be THEIR dad, how awesome is that? "I can't wake up 50 years from now and wonder where my life went. I need to wake up tomorrow and figure where my life is going." It's a constant battle, but something I am slowly coming to grips with. It's funny when you write a blog, you never know what people are going to be interested in. I could pour my heart out for everyone and expect people to just go crazy sharing a post, but it hasn't always been that way. It's the littler more simple posts that people go gaga over. One titled Life or Death Situation was my most shared post to date. By no means did it go viral, but it seems people LOVE the faces Carter makes. Happy New Year. Here's looking forward to an ever better 2012. I will continue to bring you moments and share my life with you as long as you continue to show up here. There is one thing that I have learned in the blogging world, for you, it's about me. But for me, it's all about you. I had a post on time also. It goes so fast, doesn't it? I too have two boys and I was looking a pictures of them just a couple of years old and couldn't believe how much they have grown and changed. As much as I love this minute with them I can't help but be nostalgic for the them of yesterday, and sad that the them of tomorrow is coming at me faster each year. You put out some awesome stuff! I thank you for sharing it. Again... Thank you for inserting a little fun into our crazy lives. 1: that quote above? I remember when you wrote it. And I wish i wrote it first. 2: quoting yourself is the purest form of narcissism. So congrats, buddy. You're a writer. You said a mouthful when you said "You never know what people will like." I enjoy reading your blog, watching your videos. I look forward to them. You can count on me to be around. Congrats on a great year. Thanks for keeping me entertained and informed on little dudes a couple years older than mine. Looking forward to more in 2012. Best wishes. They say the internet is shrinking the world and that must be true because I have a great friend who lives 1000s of miles away who, in all likelihood, I will never meet in person (but you never know) and I know more about you and your family than any of my hometown friends that I say hi to once in a while on Facebook. This couldn't have happened if you weren't such a kind and open person not only here but on Twitter and on Facebook. Here's to an amazing 2012! What a great Father you are! So glad to get to know you this year and happy for your success. Please consider going to the Blissdom blog conference this year. 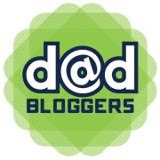 We need more of you awesome Dad bloggers to be in attendance. Happy Tuesday! Thank you all for the kind words. It just proves my point for me, YOU are the reason I continue to do what I do. Nice work, John! It is great to "see" your family....I'm pretty sure I now know you much, much better than I did in HS!